Sports are pain. That’s the dirty little secret you don’t learn until after they’ve sucked you into their addictive grasp. Sports are about losing the final game of the season, then having to acknowledge how blessed you were to even be there. Sports are a land steeped in income inequality that would make the Gilded Age blush, where the top 3 percent take home all the spoils and the bottom 97 percent get nothing and have to like it. And where there’s no income equality, there’s no income mobility: Just six teams have accounted for the last 11 MLB championships, meaning 25 have gone at least a decade without a title. If, like George Steinbrenner, you measure success or failure simply by whether you take home a ring, you’re consigning yourself to an almost perpetual state of misery by choosing to care about sports. But it’s the dream of joining the 3 percent that tempts us into that pit of despair. The promise of the orgasmic joy of celebrating a championship, and the postcoital bliss I’m told lingers for years to come, cons us into a sucker’s bet like a scratch-off ticket. Sports fandom is a triumph of hope over experience. I might be singing a different tune today if Madison Bumgarner weren’t a T-1000 model, sent here from the future to terminate those hopes and dreams for people like myself — people who don’t root for the team that had already won two of the last four World Series. But he is. And so here we are. Wednesday night, the Kansas City Royals came closer to winning a world championship than I or anyone else thought possible a month ago, let alone in spring training. After winning the wild-card bout by coming back to beat the Oakland A’s, 9-8, in the greatest game I’ve ever watched in person, the Royals swept through the Angels and Orioles in the ALDS and ALCS, respectively. They took the Giants to seven games. They went 11-4 in the postseason. That’s not only the best postseason record any team has managed without winning the World Series — it’s the best possible record a team can have under the current format without winning the World Series. But they didn’t win the World Series. They lost in Game 7. They lost by one run. They lost by one base. But they lost. It was the outcome I not only feared, but also expected, precisely because it didn’t make any sense. The Royals had refused to bow out when they found themselves down four runs to the A’s with six outs remaining. They had gone a perfect 7-0 against the 98-win Angels and 96-win Orioles. An 88-win Giants team from the inferior league — the AL has beaten the NL in interleague play 11 straight seasons — was all that stood between the Royals and baseball nirvana. The Royals had captured America’s heart in a way only possible for the team that had gone longer without making the postseason than any other franchise in the big four professional sports. According to ESPN’s SportsNation, literally every state in the union was rooting for the Royals over the Giants, including California, where the Giants’ own fan base was no match for Dodgers Hate and A’s Envy. Everything was lined up for the perfect ending, but if there’s one thing I’ve learned about sports, it’s this: Never expect the perfect ending to actually happen. In sports, Voldemort beats Harry. The six-fingered man doesn’t prepare to die. Sauron claims the Ring. Call it the Rule of Gordon: If perfect endings existed, Gordon Hayward’s half-court prayer against Duke would have found the bottom of the net, and Alex Gordon would have circled the bases in the bottom of the ninth on Wednesday like his hair had caught fire, and the Royals would have gone on to win. But sports are like life: There’s joy, and suffering, and a whole lot of tedium and ennui. And there are no perfect endings. So much of fandom is the shared experience — not simply witnessing moments and wins and losses, but knowing there’s a community around you witnessing those same things and caring about them as much as you do. Even painful memories galvanize and unite a fan base, further forging that sense of community. To be able to go up to a complete stranger wearing your team’s colors, to be able to begin a conversation based on nothing more than shared memories, is a powerful thing. To be able to say, “Hey, do you remember [X]” to tens of thousands of people forges a bond and a sense of belonging that makes being a fan of a team — even a team with a tortured history — worthwhile. The problem is that until a month ago, the Royals didn’t have [X]. They didn’t have a tortured history, because since 1985 they had no history. There wasn’t a single on-field moment that resonated with the entire fan base, unless you count the moments of comic futility: the dropped fly ball that extended a losing streak to 11 games; the time our first baseman inadvertently clocked the pitcher when trying to throw a ground ball home; the time two outfielders each jogged to the dugout expecting the other to catch the third out, only for the ball to drop behind them. Everything was lined up for the perfect ending, but if there’s one thing I’ve learned about sports, it’s this: Never expect the perfect ending to actually happen. In sports, Voldemort beats Harry. The six-fingered man doesn’t prepare to die. Sauron claims the Ring. We had moments of misery, but we didn’t have moments that mattered. No Royals fan under the age of 35 could go up to another and talk about that one Royals game, because there was no one Royals game. We were a hollow fan base, with a hard shell of devoted followers — devoted beyond reason, honestly — but a core devoid of anything worth rooting for. If nothing else, the past month has filled that void to overflowing. Each game in the Royals’ giddy eight-game winning streak to start the postseason delivered at least one iconic moment. Game 1 of the ALDS against the Angels featured Nori Aoki blindly stabbing his glove out and catching Howie Kendrick’s potential two-run double as Aoki’s face crashed into the outfield wall, preserving a tie that the Royals broke in extra innings. The next night saw Eric Hosmer flat-out murder a baseball in the 11th inning with a man onboard, the precise moment when I realized that this just got real — that the Royals were probably going to win Game 2, which meant they were probably going to win the ALDS, which meant they were one series away from playing for a world championship. In Game 3, the Royals rolled out to an early lead against the Angels at home, and there was Billy Butler — maybe the slowest man in baseball — stealing second base, looking for all the world after he stood up like he was the cat who ate the canary. In the ALCS, there was Wade Davis quieting a raucous Camden Yards crowd by striking out the side in the ninth in a tie game in the opener, followed by Gordon parking a Darren O’Day pitch in the right-field bleachers in the 10th. There was Lorenzo Cain making sensational catches on back-to-back line drives in the fifth inning of Game 2, getting to his feet and flexing his muscles like he was in a Mr. Olympia competition. There was Mike Moustakas tracking a foul ball right up to the edge of the Dugout Suites at Kauffman Stadium in Game 3, flipping over the fence, his fall cushioned by the fans — and coming up with the catch. There was Alcides Escobar sliding into home plate in the first inning of Game 4, kicking the ball away from Caleb Joseph and leading to the only two runs the Royals would need to clinch the pennant. And before any of that, there was the wild-card contest, arguably the greatest baseball game since Game 6 of the 2011 World Series. The wild-card win itself gave Royals fans more memories than the previous 29 years combined: a three-run rally in the eighth on a procession of singles and walks and steals; Jarrod Dyson’s Dave Roberts moment, stealing third base with one out in the ninth and scoring the tying run moments later; Hosmer’s triple off the wall with one out in the 12th; Christian Colon topping an infield single to tie the game; and Salvador Perez erasing an atrocious game with a walk-off single past a diving Josh Donaldson two batters later. Those moments mattered. They will always matter. 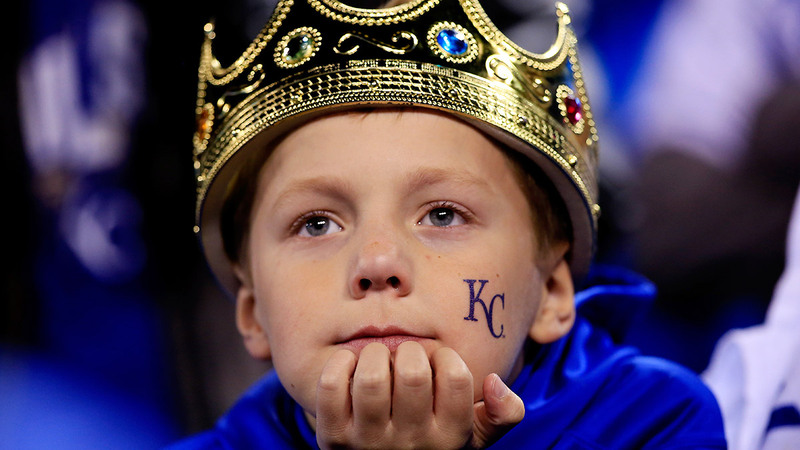 For an entire generation of Royals fans, they were the only moments that mattered. What happened Wednesday night doesn’t change that. It’s just that it almost made those moments matter so much more. It was clear from the first inning of Game 1 that the Royals had met their match in the Giants, or at least that they’d met their match in Bumgarner. He threw seven brilliant innings in the opener, allowing only a solo home run when the Giants already held a 7-0 lead. After the teams split the first four games, he threw a complete-game shutout in Game 5, sending the Royals back to Kansas City down 3-2. The Giants had wins on their side; the Royals had home-field advantage, and recent history: Eight of the last 10 home teams down 3-2 had gone on to win the World Series. After attending Game 1 with my brother and Game 2 with my wife, I flew back to Kansas City alone on the morning of Game 6, and this time we got the gang back together: I sat with Alex Robinson and Chris Kamler, who were my seatmates for the wild-card game. It worked the first time, and it worked the second time: Game 6 was a TKO in the second inning, when the Royals put up a seven spot. They won, 10-0, without having to use any of their three dominant relievers. After the game the mood was celebratory, and not just because the three of us got to hang out with Lee Sung-woo, who had returned from South Korea, the talisman of the Royals season brought back to Kansas City for the World Series by a documentary crew trailing his every move. We prepared for Game 7, an elimination game for both sides. The good news: The Royals had won eight straight elimination games dating back to 1985. The problem: The Giants had won seven straight elimination games themselves. The Giants struck first off Royals starter Jeremy Guthrie, scoring two runs in the most Giants way possible: a hit-by-pitch so slight we didn’t see it from the stands; back-to-back singles on two-strike counts; and then a pair of run-scoring sac flies, the second made possible only because Hunter Pence had tagged from second to third base on the first one. The Royals struck back immediately with two of their own, but in the process, Bruce Bochy pulled starter Tim Hudson. That seemed ominous; I felt before the game that the winner might be determined by which manager pulled his starter faster in favor of his elite bullpen options: Kelvin Herrera, Davis, and Greg Holland for the Royals, and Bumgarner for the Giants. Guthrie pitched a scoreless third, which was good, but he retired the side in order, which was bad, because it gave the illusion that he was rolling and tempted manager Ned Yost to keep him in. After the third inning, I tweeted this. Before the game, Yost had said that if Guthrie gave him four innings, the Royals would be in great shape. That meant he planned to use Herrera, Davis, and Holland for five innings, but it also meant he only planned to use them for six innings if he had to — and if you get into a situation where you have to, it’s already too late. But Guthrie started the fourth. Pablo Sandoval beat out an infield single when Omar Infante’s leg slipped on the grass as he pivoted to throw to first base. Pence singled to center. Guthrie retired Brandon Belt on a fly ball to left field, but Sandoval tagged up and challenged Gordon, who probably has the best arm of any left fielder in the majors. Ordinarily, having a guy nicknamed Kung Fu Panda — they don’t call him that for his martial arts skills — tag from second to third on a ball to a left fielder with a cannon is a suicidal move. This being the Giants, it worked. Only then did Yost call for Herrera, who got ahead of Mike Morse, 0-2, and then shattered Morse’s bat — but the ball carried to right field far enough to fall in for a single. Sandoval scored. Herrera would right the ship by striking out Brandon Crawford and retiring Juan Perez, but the Giants had taken a one-run lead with 18 outs to go. We didn’t know it then, but the game was over. Jeremy Affeldt, who had relieved Hudson in the second inning, threw 2.1 scoreless innings. Affeldt began his career with the Royals in 2002, and he was a huge part of the fluky 2003 team that squeezed a winning record in between 100-loss seasons. He never panned out in Kansas City, though; by the time everyone figured out he was destined to be a reliever instead of a starter, he had been traded. Wednesday, in the biggest game on the biggest stage, he was back to torture us. He didn’t allow a run, extending his postseason scoreless streak to 23.1 innings. And then it was time for the Bumgarner show: sixty-eight pitches on two days’ rest. Five innings. No runs. One fan base utterly destroyed. Before Game 7 started, I had already resigned myself to a loss, not because any of the indicators suggested that the Royals weren’t favored, but because all of them suggested they were. The Royals had a chance to do something magical, and to do it in the most perfect way possible: in a Game 7, in front of a home crowd, with the entire nation rooting them on. The road team hadn’t won Game 7 since 1979. The Royals had everything in their favor. Of course they were going to lose. Sports are pain. Happy endings are for fairy tales. But even as Bumgarner overpowered and befuddled Royals hitters, even as the outs ticked away, we kept believing that something good would happen. The 1985 Royals were down a run entering the ninth inning of Game 6. The 2001 Diamondbacks, who like these Royals had won Game 6 in a blowout, were down a run entering the ninth inning of Game 7. Keep it a one-run game, we thought, and maybe history would repeat itself. It was a one-run game going into the bottom of the ninth. 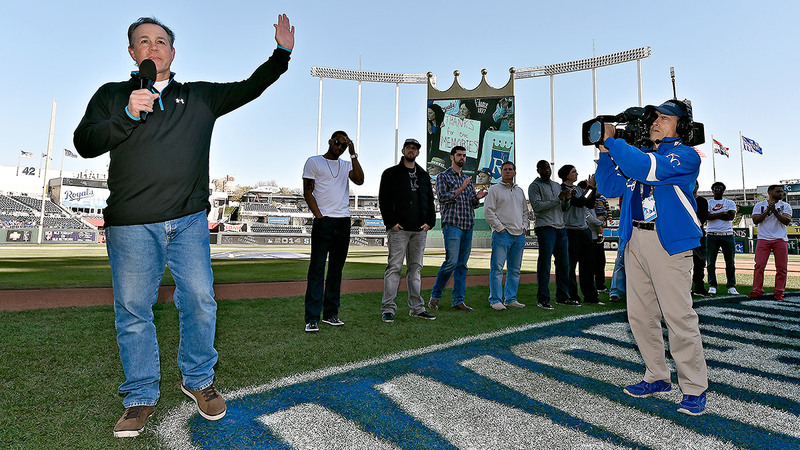 Hosmer, who’d already delivered his share of postseason magic, led off. This time, he struck out. Butler, who’d homered off Bumgarner in August, popped up to the first baseman. Gordon came up. The count was 0-1. And then something good happened. Very good, even. Just not good enough. I have little doubt that at some point in the months or years to come, I’ll wake up in a cold sweat muttering They should have sent Alex. Gordon smoked a line drive that appeared it would fall in front of center fielder Gregor Blanco, but Blanco played it as if he had a chance to catch it until it was too late, and the ball skipped past him and headed to the wall. Gordon accelerated into a higher gear, and then Juan Perez, who was backing up Blanco, bobbled the ball at the wall, and for one glorious moment we contemplated the utterly unthinkable: a Little League inside-the-park “home run” to tie Game 7 of the World Series with two outs in the bottom of the ninth. Just writing that sentence makes me tingle. Alas, it was another glorious moment, but not the glorious moment. Crawford caught the relay throw in short left-center field when Gordon was a step from third base, having already received the stop sign from third-base coach Mike Jirschele. Stopping Gordon was the rational, reasoned decision: If Crawford doesn’t completely botch the throw home, Gordon’s out by 30 feet. But I’ll never know if it was actually the right decision. Gordon was unlikely to score, but Salvador Perez was also unlikely to drive him home from third base. As Nate Silver wrote, if the odds of Gordon being safe were even 30 percent, the right move was to send him. But as Jeff Sullivan of FanGraphs wrote, the odds of him being safe were probably not even close to 30 percent. Jirschele, who had spent 36 years toiling in the minor leagues before finally getting promoted to the major league staff this season, was nearly flawless all season as the third-base coach. Earlier in the game, he had waved the glacial Butler home from first base on Gordon’s double — the third time in the postseason he had done so, and the third time Butler was safe. I can’t fault the decision one bit, even if I won’t be able to help but ponder the what-if for a lifetime. And then Salvador Perez batted on one leg — Hudson had nailed him with a pitch in the second inning, and the catcher still wasn’t walking right — and Bumgarner threw him nothing but pitches a foot above the strike zone, and Perez swung at almost all of them, finally sending a popup skyward, eerily reminiscent of the popup Perez himself had caught in Chicago nearly five weeks ago to clinch the Royals’ first postseason spot since 1985 and set off this crazy run. Sandoval caught it, and fell on his back in joy, and I wanted to fall on my back in despair. One base away. Forever one base away. To come so close to winning — or at least to forcing extra innings, which, given the crowd, the prospect of another inning from Holland, and the fact that Bumgarner couldn’t have gone more than another 150 pitches or so, seemed to favor the Royals — means there are so many little things we can point to as potentially costing the Royals a title. Gordon not running full speed out of the box is what looms largest simply because it came at the end, but I can’t get too upset at one of the most fundamentally perfect ballplayers the Royals have ever produced for not thinking two different Giants would misplay his line drive. The Royals have returned to the land of the living. Sports are pain, but pain is something only the living can feel. 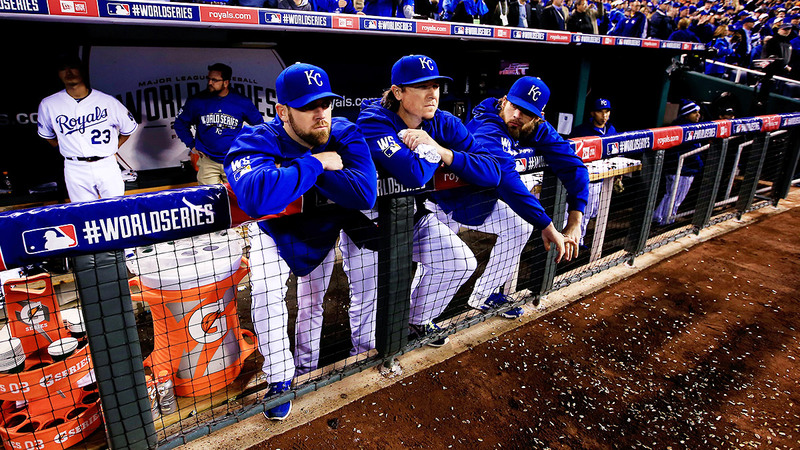 For far too long, the Royals weren’t good enough to trigger any nerve endings. You stand up after your foot’s been asleep for 29 years, and the pins and needles are going to drive you crazy for a while. But it’s better than being numb. Yost could have — should have — shown more urgency to go to his bullpen. He was willing to go 5.2 innings with Herrera, Davis, and Holland; if he had been willing to go six and start the fourth with Herrera, they might have won. But still: He turned to his three best relievers with one out in the fourth inning. How upset can I really get? Yost could have used Josh Willingham to pinch hit for one of his left-handed batters against Bumgarner, but I can’t say with any certainty that it would have made a difference. There’s no way Escobar should have bunted on a 2-0 count in the fifth inning, but it very nearly worked: After, Aoki sliced a ball down the left-field line that only failed to tie the game because of good defense from Juan Perez and great positioning from the Giants. I’m more upset about the grass that slid out from under Infante’s feet, allowing Sandoval to beat out the single that set up the winning run in the fourth inning. I’m more upset about the pitch that Sandoval allowed to graze his elbow in the second. If the Royals retire Sandoval there, the Giants don’t score either of their two runs, and the story of the game might well have been the Herrera-to-Davis-to-Holland relay protecting a 2-1 lead for six innings and a title. I could go crazy trying to reverse engineer the butterfly effect. So many little things could have broken for one team or the other. In Game 7, more of them broke the Giants’ way. Short of blowing the game by coughing up a lead, the Royals came as close as a team can come without winning a championship. (I am thankful for small mercies. I have no idea how Texas Rangers fans carry on.) But they didn’t win. They lost so that the San Francisco Giants could toss another ring in their drawer, clinching a legitimate dynasty — three championships in five years — for a team that never won 95 games during the regular season, and averaged barely 87 wins a season in that span. And then, before all the Giants had even reached the dog pile, the chant broke out. “LET’S GO ROY-ALS! LET’S GO ROY-ALS!” It was spontaneous, and cathartic, and it spoke to how improbable this whole ride was, how an entire fan base and an entire city — Game 7 carried a 58.3 TV rating in the K.C. market — and at points an entire nation got caught up in a completely unexpected whirlwind in late September that upended everything we thought we knew about baseball. Until the wild-card game, no one expected this team to go so far. We were the proverbial happy-to-be-here folks. That’s why the crowd was so nuts during the A’s game: As far as we were concerned, that was our World Series Game 7. For a generation, the only thing the Royals were good at was being a prop, the other team in the montage of season highlights for pennant winners and world champions. Our only cinematic moment was as the patsies in the historically accurate climax to Moneyball. Then, suddenly, and then continuously for nearly four weeks, the other teams were the patsies, the hapless victims of Royals rallies, the luckless losers after another Royals extra-inning victory. Sports fans think their team is a Team of Destiny, but every team is a Team of Destiny. We just don’t know what that destiny is. What hurts so much isn’t that something was taken away from us, but knowing that something amazing and life-altering was very nearly given to us. A title is rare enough; to win a title like this — with a generation of irrelevance melted away in an instant — wouldn’t have been a once-in-a-lifetime experience. It would have been something most fans will never experience. We were 90 feet away from the kind of triumph you might see once or twice a decade in all of sports. We were so close to it that we were planning for it — by necessity. The city had the parade route mapped out for today. There was champagne on ice in the clubhouse. Everything was perfect. Everything but the ending. And that will live with us for a long time. But if the ending will live with us, so will everything that made it possible. The Royals didn’t just bring us joy for a month or give us memories to last a lifetime; they gave us a sense of mattering again. The Royals are relevant. They are the champions of the American League. Yost will manage the All-Star Game next season. We didn’t #TakeTheCrown, but we still own the pennant — a pennant the Yankees and Red Sox and Tigers can never take from us. More than one Cubs fan has already told me he’d trade a testicle for the chance to lose a World Series by one run. The Royals have returned to the land of the living. Sports are pain, but pain is something only the living can feel. 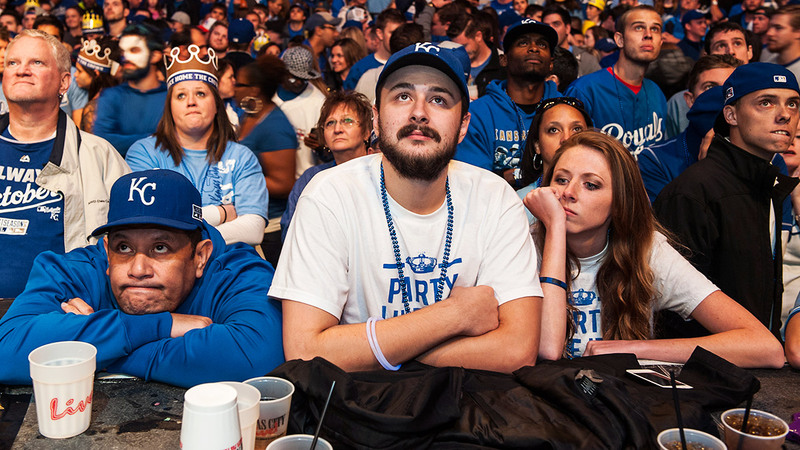 For far too long, the Royals weren’t good enough to trigger any nerve endings. You stand up after your foot’s been asleep for 29 years, and the pins and needles are going to drive you crazy for a while. But it’s better than being numb. For a quarter-century, there was nothing for Royals fans to discuss. Now, “they should have sent Alex” will be our shibboleth until they finally win it all. I’ve never felt more connected to the team, or to the city that has become my second home over the years even though I’ve never lived there. Robinson and Kamler are my playoff partners for life — we’re already talking about meeting up again in Kansas City for the playoffs next October, as if the 29-year interregnum between playoff appearances never happened. Lee is on a flight back to South Korea today, but none of us will ever forget him, and if I ever make it to Seoul in the future I know I have a friend I can look up. Sports are pain. But there’s meaning in that pain. There’s a sense of belonging in that pain. It’s that meaning and that sense of belonging that kept me tied to the Royals for the last 29 years, and that made the last five weeks the most joyful, exhilarating ride I’ve ever been on. And I imagine it’s that meaning and that sense of belonging, more than the hope of the final payoff, that will keep me tied to the Royals through whatever pain is still to come.